Twelve women met at Margaret Wentworth’s apartment for our monthly meeting. Jo-an Jacobus offered the devotions and program from this year’s Blueprints. It was titled “Listening for the Voice of God” and was written by Mary Glen Hadley about a time when God gave her courage. We were asked to share times when we needed to look to God for courage in our lives. In business, we approved last month’s minutes and the treasurer’s report. The Tedford Meal for November was ham steaks, baked beans, pasta salad, green beans, corn bread and a desert. We have two new members for Tedford teams who have lost members, but we could use more help! 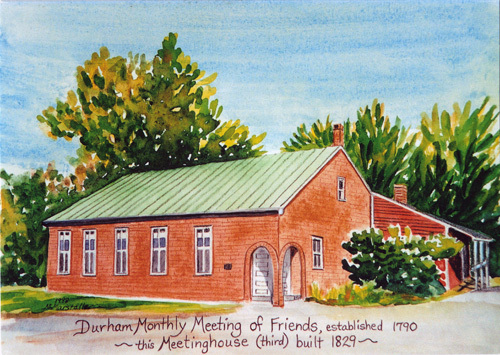 If any Durham Friends attendees or members would like to join a team, please speak with Kitsie Hildebrandt or another Woman’s Society member. Prayers were asked for the Barber family in Belize, who have had many trials and tribulations in their family and the students they serve. A few women at the meeting also asked the group to pray for others they knew who are in need of prayers. The card ministry was done. Our member who leads the card ministry is moving to another state and Woman’s Society is looking for another member to take on this role and coordinate the card ministry. It was confirmed that Woman’s Society will sponsor Christmas Bags for up to 10 individuals or families. We will also request donations of mittens, hats, scarfs and gloves to be hung on the mitten tree so these items may be donated to local organizations that serve populations in need. We all agreed we will have a homemade Christmas gift exchange at our next meeting. Fudge is encouraged. The Meeting ended with a closing poem by Kitsie Hildebrandt. We adjourned to refreshments of caramel apple pudding, grapes, mixed nuts, crackers and tea provided by Margaret. The next Meeting will be our annual Christmas Party, which will be held on December 16 at Angie Reed’s home at 7 p.m. All are welcome to attend. This entry was posted in Woman's Society News and tagged December 2013. Bookmark the permalink.